Has two years of Jared Kushner been two years of winning? Absolutely. If Never-Trumpers are reconsidering Trump in the aftermath of the Kavanaugh fight, then why shouldn't the MAGA crowd give Kushner a second look? Several inconceivable things have happened since Trump has entered the White House - including the successful renegotiation of terrible trade deals to be good deals for America and without triggering a trade war. Mexico and Canada are working with the United States instead of bickering with us. We have a new trade pact with South Korea, and even China is coming around. Kim Jung-Un is no longer lobbing missiles over Okinawa, and the American embassy is now located in Jerusalem. The Middle East hasn't exploded, and ISIS is broken and scattered. President Trump is beginning to get grudging credit for these things, even from some Never-Trumpers such as New York Times writer Bret Stephens, who wrote that he was grateful the president never "...backed down in the face of the slipperiness, hypocrisy and dangerous standard-setting deployed by opponents of Brett Kavanaugh’s nomination to the Supreme Court." If Trump deserves reconsideration, then perhaps the hidden genius of the Trump White House does, too. That's outgoing U.S. Ambassador Nikki Haley's term for senior White House adviser and presidential son-in-law Jared Kushner. He’s been heckled for most of the two years of the Trump presidency, including by those within the GOP. But the fact is the president relies heavily on Kushner’s advice and this advice has resulted in inarguably good policy - for America. For example, the successful renegotiation of NAFTA, which might not have happened without the behind-the-scenes help of Jared Kushner, who worked on behalf of the president to smooth many ruffled feathers. A Reuters story quotes Mexican Foreign Minister Luis Videgaray - whom Kushner knows personally - crediting him with being instrumental in preventing trade negotiations with Mexico from falling apart. “On every occasion, it was one person that always found a way to put (the deal) back together: Jared Kushner.” His personal skills appear to be paying big dividends for the president - and the country. And not just south of the border. The administration’s recent - and equally successful - trade negotiations with Canada also benefited from the Kushner Touch. The head of the Canadian Labour Congress told Reuters that Kushner established a critical working relationship with two key advisers to Canadian Prime Minister Justin Trudeau - his chief of staff, Katie Telford, and his private secretary, Gerald Butts. While many news outlets were airing almost non-stop fake news about the U.S. and Canada on the verge of coming to blows over tariffs on cars and dairy products, these two Trudeau advisers reportedly flew to Washington and met with Kushner to hammer out the details. The result of which was a good deal - for both countries - and a public rapprochement between President Trump and Prime Minister Trudeau, who had been portrayed as very publicly at odds just a few weeks prior. There’s a clear carrot and stick approach at work. Trump holds the stick - and Kushner the carrot. Donald does bad cop, Jared does good cop. The same dynamic could play out with regard to the squabble - for now - between the United States and China over trade issues. Because - once again - Kushner has developed deal-making personal ties with key behind-the-scenes players, in this case the Chinese Ambassador to the United States, Cui Tiankai. 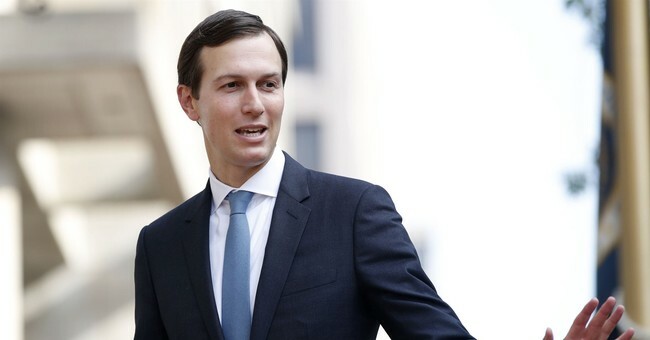 A few months ago, Kushner was interviewed by Al Quds regarding the U.S. recognition of Jerusalem as the capital of Israel and the opening of the U.S. Embassy there. President Trump promised to do both things - and (once again) delivered on his promise. Feathers were ruffled - as they were when the president insisted on renegotiating what had been bad trade deals. The Palestinian leadership severed all contact with U.S. officials. And as before, Kushner is behind the scenes, like a master technician, patting down those ruffled feathers. The Al Quds story quotes Kushner - undoubtedly with the blessing of the president - stating that he is " . . .ready to work with (Palestinian) President Mahmoud Abbas, if he wishes." Kushner is offering to negotiate - not capitulate. This position resonates strength and commitment, without which successful negotiations almost never happen, because no one respects a weakling. Peace through strength. And strength encompasses magnanimity. Kushner's comments were not just directed toward the Palestinian leader but toward the Palestinian people: "You deserve to have a bright future . . . now is the time for both the Israelis and the Palestinians to strengthen their leaderships and refocus them to encourage them to open up towards a solution . . ."
Kushner is also actively working with the leadership of other Middle Eastern countries to mend fences. He recently met with Egyptian President Abdel Fattah al-Sissi and Jordan's King Abdullah to talk about "the need to facilitate humanitarian relief to Gaza (where there were mass protests in the wake of the Jerusalem announcement last December) and the Trump administration's efforts to facilitate peace between the Israelis and Palestinians." Middle East peace talk has been going on for decades, of course. But - as with the trade deal negotiations - this is the first time action may follow in the wake of words. Kanye West's pow-wow with the president and Kushner last week happened in part because of Kushner's alliance with Kim Kardashian, Kanye's wife, and their advocacy for prison reform, including the creation of job opportunities for drug offenders in West's home town of Chicago. The president - who wrote about the Art of the Deal long before he became president - seems to have found a simpatico adviser and effective deal-maker in his son-in-law. Many members of the conservative movement, and even some of my clients once held a jaundiced eye towards Jared Kushner, but effectiveness works, and he has delivered large portions of the Make America Great Again agenda. That is something all Trump supporters ought to consider as Kushner's win streak is reappraised and commended.